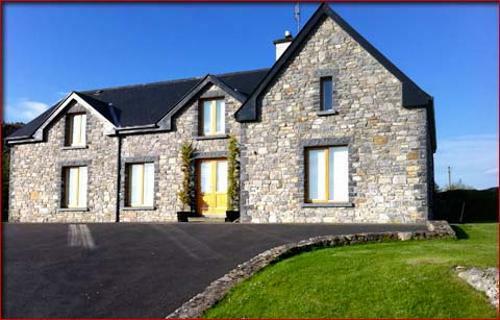 Pontoon House is a magnificent traditional stone dormer bungalow, situated on a 1 acre elevated site overlooking Lough Cullin and nestled between the Nephin and Ox Mountains just outside Pontoon, County Mayo. The house enjoys views that are some of the most scenic and spectacular in Ireland. This purpose built 4-star self-catering accommodation offers all modern luxuries together with comfort and style and is an ideal base for exploring County Mayo and other areas in the West of Ireland including counties Clare, Galway, Sligo and Donegal. There is a superb overall atmosphere both in the house and around the area with total peace & tranquility where one can enjoy lovely lazy country walks, 2 superb restaurants with in 3km form the house and fishing on the doorstep. Traditional stone dormer bungalow superbly furnished & equipped. Pontoon house is constructed of original stone, tastefully designed with extensive use of wood and set on a rocky outcrop overlooking Lough Cullin with nature’s backdrop of a granite hill, boulders, heather, silver birch and mountain ash. The bedrooms have stunning views of the lakes, their islands and mountains.